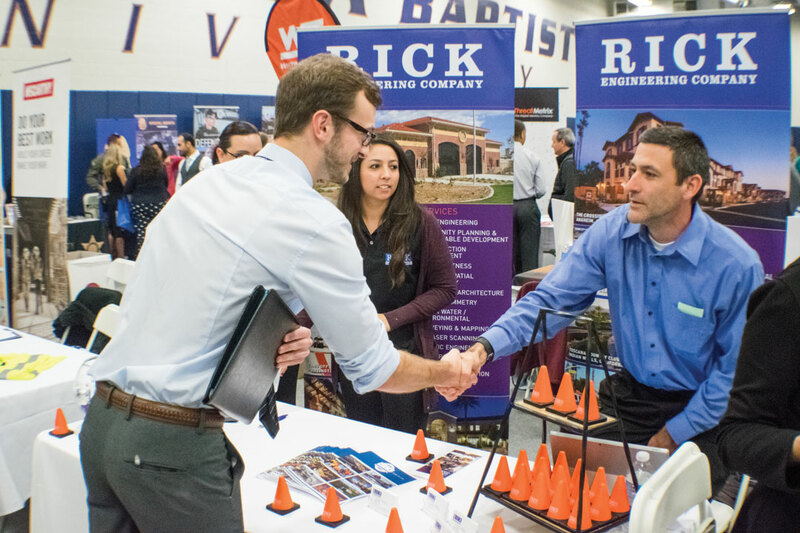 The Recreation Center hosted the Career Center’s Business, Engineering and Communications Fair Feb. 22, in which more than 100 employers looked for college students to potentially fill temporary or full-time positions in a variety of fields. The event was from 1 – 4 p.m. and provided California Baptist University students the ability to gain experience in talking with employers and the chance to secure employment upon graduating or even while still in school. Lisa Singer, employee relations specialist at the Career Center, described the process of putting together the event. The Career Center highly recommended being prepared mentally and visually for the event. Students were suggested to bring at least 50 copies of their resume and at least a notepad to gain a better understanding of what employers were looking for by taking notes. Brittany Johnson, senior psychology major, commended the Career Center in the diversity of companies at the event. To enter the event, current students and alumni needed to dress professionally. This included a suit and tie for men and business formal attire for women. The requirement helped students prepare for interviews in addition to the typical business attire required of them in the workplace. Singer went on to compliment CBU students and explained that their ability to speak to employers and present themselves professionally were some of the greatest assets to her as the career fair planner. After spending time researching and practicing their introductions, CBU students were able to make an effective appearance in front of their potential employers yet again at this career fair.